What could Ronaldo’s lecture mean? Sadie’s Song is probably the episode with the distinction of having the least lore so far. Certainly no new facts we could really chew on. Ronaldo’s “act” for Beachapalooza, a lecture about “rock people”, how to identify them and defend yourself against them. It’s not much, but we can wonder how much Ronaldo really knows. Ever since the end of Keep Beach City Weird! Ronaldo has decided that rock people are responsible for all the weirdness in Beach City (where does he come up with this stuff?). We can see on his board, at the far right, a fairly good representation of a rock person. A triangular head though. That looks familiar… Oh wait! We know that Ronaldo has seen Peridot before, back when she broadcast her distress call in Cry for Help. But he didn’t think she was a rock person before, so it’s rather odd that he would base the appearance of a rock person on an eco-terrorist android. Odd until you look to the left of the chalkboard. 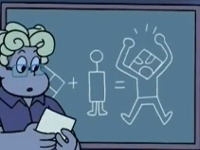 Partially obscured by Ronaldo, there is still quite clearly drawn on the board the old symbol of the Diamond Authority (a term the fans have lovingly adopted from Ronaldo), from back when there were four rulers of the homeworld Gems. If Ronaldo was able to subconsciously grasp the truth of the Gems back in Keep Beach City Weird!, why would he not be able to do it again for Peridot? That just leaves the image in the center. Fans have observed that it looks an awful lot like a kinder, gentler version of one of the injectors from the Kindergarten (human legs rather than virus legs). It makes sense: when the Diamond Authority shows up and starts using injectors, you end up with Gems (sorry, we mean rock people). So where could Ronaldo have learned about the injectors? Steven could possibly have told him, but not only is it not a very fun explanation it seems a bit far-fetched that Steven would not only tell Ronaldo about the Kindergarten but describe the injectors in detail. Besides, that leaves unexplained where Ronaldo found a picture of the old Diamond Authority’s symbol. The ship that crashed into Beach City only had the modern symbol in it. There are no answers, only questions. Ronaldo is very good at scouting out information, so he must have done his own research. The old symbol could feasibly have been a symbol recorded in archaeological sites, and could have been paired with other symbols that made Ronaldo think of rock people. The injectors are a bigger mystery. 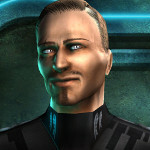 It is suspected that humans actively participated in the rebellion, and if they did it would make sense that they would record who they were rebelling against and why. These civilizations were probably destroyed by the homeworld before they fled the planet, but some structures or records may have remained. When I first saw Peridot I wondered if all homeworld jems would be gem/cyborg hybrids. Jasper showing up kind of messed up that theory though. She looked like a regular gem without cyborg parts. Jasper just used the tech as a hand held weapon instead of fusing it with her body. I’m quite disappointed we never got a Keep Beach City Weird! blog post about Ronaldo’s Beach-a-Palooza presentation (or anything else since the third StevenBomb). You and me both. Mr. Jones-Quartey was probably responsible for the blog, and now that he’s working on Lakewood Plaza Turbo he’s not available to do Steven Universe stuff.